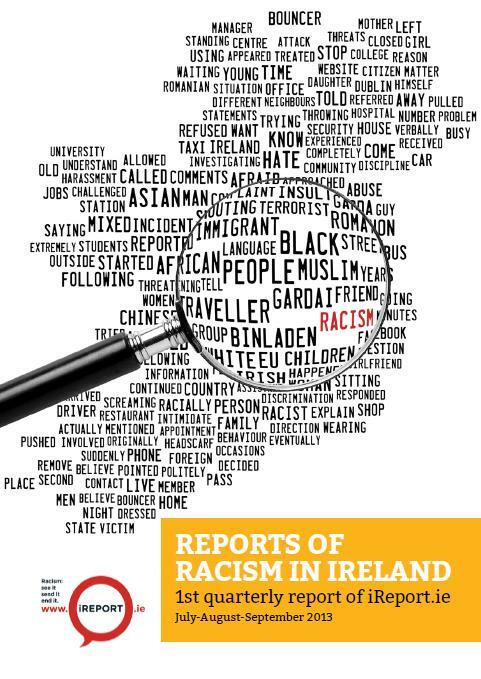 The iReport system for the reporting of racist incidents in Ireland was launched in July 2013. Reports can be made directly through the website or through a partner organisation. Questions are designed to capture a large amount of detail about racist incidents, including information about where, when and how the incident occurred and details about the victim(s) and perpetrator(s). The system also captures information about why the incident has been perceived as racist, its impact on the victim and/or witnesses, and the interplay with age, gender, sexuality and disability. The recording system has been designed to allow comparison with international patterns and to facilitate understandings of racism which are particular to the Irish context. Analysis of the data has been carried out by Dr. Lucy Michael in consultation with Shane O’Curry, Director of ENAR Ireland. Ninety-seven incidents were reported to the iReport system in the period between July and the end of September. Eleven of these were reported through another organisation. Doras Luimni, for example, recorded 7 of these. This partially accounts for the higher number of reports recorded in Limerick compared to other counties outside Dublin. It was expected that the number of reports may be low in the first recording quarter as the survey was publicised to allied organisations and publicly launched. However, victims and witnesses also used the iReport system to report incidents occurring prior to this period. Fifty-five incidents were reported as occurring in July to September, and a further 17 in the earlier months of 2013. It is expected that this pattern will continue through future reports. The reporting of incidents prior to this period is important. It points both to the severe impact of such incidents on victims and witnesses, which can last for years, and the absence of other appropriate reporting systems.